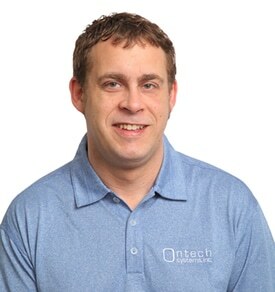 Jared Olson is the Cloud Services Manager at Ontech Systems. He has been working in the IT industry for over 17 years and has extensive knowledge and experience on a variety of Information Technology topics. He has 9 years of experience as a Technical Consultant including 4 years at Ontech. Jared grew up in South Milwaukee, WI and attended South Milwaukee High School. After that he attended the University of Wisconsin-Whitewater and studied graphic design for two years. After leaving UWW Jared attended Milwaukee Area Technical College to earn an Associate’s Degree in Microcomputers and Networking. He is a Sophos Certified Engineer, CSSA, and holds a number of Microsoft Partner Network competencies and is currently pursuing Microsoft Azure certification. Jared and his wife Kelly live in Waukesha and have two children, Nico (13) and Jordyn (3 ½). Jared coaches soccer and baseball for Nico and enjoys watching Jordyn perform gymnastics. Session Summary: We have all heard the term data backup, and know that businesses of any size should have data backup in place. But does it work? It is there to get your business up and running again as soon as possible if something were to go wrong. Did you know that you can test your data backup solution? How long would your business be down if you didn’t have any business continuity solutions in place? John has been working in Information Technology for over 18 years and has experience in environments ranging in size from a single server and a few desktops up to several hundred servers and thousands of desktops around the world. He focuses on developing business process focused IT environments with an emphasis on security and standards-based systems. This has allowed the companies he works with to look at IT as a catalyst for process improvement and value rather than a cost center. With an educational background in teaching, he also enjoys helping to demystify computers for people, and assists companies in getting the most value for their investment by showing employees how to best utilize the tools they have available. Session Summary: It’s become common to hear about cyber-attacks in any type and size of business. Large, medium, and small organizations are all vulnerable to attacks. What can you do to keep your network secure from cyber-attacks? Is your environment safe from a physical attack on your network? Has your network security been tested? Come learn how to evaluate your network and what the best practices are that you can use to keep your organization safe. Holly is a privacy and security consultant who has worked with the HIPAA privacy and security rules for over fourteen years. As a former Privacy Officer for a health care system, she developed and oversaw all privacy and security initiatives. She is recognized for helping small to large sized organizations understand and become compliant with these regulations in an organized, ethical, and straightforward way. Holly has extensive experience in developing customized privacy and security policies, procedures, forms, and education programs. She has completed HIPAA privacy compliance assessments for organizations. In addition, she has facilitated security risk analyses for over 100 covered entities, business associates, and other types of organizations. Compliance areas covered during these security risk analyses include the HIPAA security rule, NIST 800-53 revision 4, NIST cybersecurity, and FISMA. Active with HIPAA Collaborative of Wisconsin (HIPAA COW) since 2002, Holly is currently a Board member, the Executive Vice President, and on the Privacy & Healthcare IT networking groups. She co-chairs their Risk Management networking group and was the primary author of the HIPAA COW Risk Analysis & Risk Management Toolkit. She has also participated in several national networking groups. Holly has spoken for several state and national conferences and webinars. Session Summary: Health Insurance Portability and Accountability Act (HIPAA). Who is required to be compliant with it? Does my organization need to follow it and if we do, what does that mean? What requirements are in the Privacy, Security, and Breach Notification Rules? What are some consequences of being non-compliant? During this session we will explore these questions and discuss actions your organization may take to build and improve its privacy and security compliance program. Pallin joined Cities & Villages Mutual Insurance Company in 2003. He is responsible for building and enhancing member relationships and engagement with CVMIC. He acts as a liaison for the members and strives to create an excellent member experience during every interaction. In addition, Pallin provides loss control service, leadership training, and risk management assistance. He has a B.S. degree in Engineering from UW-Platteville. He has over 23 years of experience in loss control, safety consulting, and customer service working in both the private and public sector. Pallin is a Certified Safety Professional with an Associate in Risk Management, an Associate in Loss Control Management, and he is a licensed insurance agent. Session Summary: Have you wondered what your cyber liability insurance actually covers? What should you do if a security breach is suspected or occurs? How do I train yourself and others to recognize attempts to circumvent your cyber security measures? Join us to review the prevention tools available, the insurance coverage you have, and how to prepare to properly respond should a cyber-attack occur. Holy Angels School is dedicated to helping students to grow and mature in faith, knowledge and values by providing a quality curriculum with high academic and behavioral standards. Over the past 11 years, the Holy Angels Annual Golf Classic has raised over $100,000 to support their mission. This year, we are joining them as a sponsor to support curriculum enhancements at Holy Angels School. If you are interested in joining us for a morning of golf and fun, you can find information on their website and get involved by becoming a sponsor, golfer or raffle donor. The event will be held at West Bend Lakes Golf Club on Friday, August 7th at 8am. We hope to see you there! The Walk to End Lupus Now-Milwaukee is a family event that took place on Saturday, June 7th at Mount Mary University. 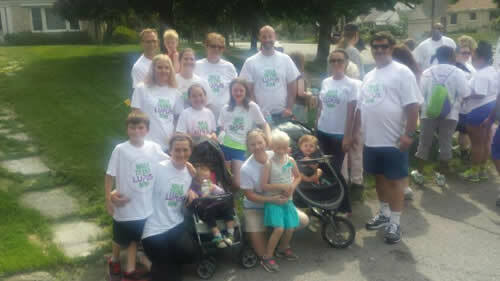 Ontech Systems joined the effort and sponsored a team this year for the 13th annual walk on behalf of Nicole, Mark Dohnal’s wife who was diagnosed with Systemic Lupus and Kidney Disease nearly 7 years ago. The walk offers a chance for those living with Lupus, to come together while raising awareness and funds with their friends and family. Scott has been with Ontech Systems for nearly 3 years, while displaying and meeting the expectations and requirements to become a Senior Technical Consultant on our staff. Through his abilities to handle customer needs in a timely manner, Scott has consistently provided excellent support for our clients. Over the years, Scott has demonstrated the willingness to learn and stay up to date with the latest and greatest advances in technology in the IT field. Congratulations again to Scott Howard. Everyone at Ontech Systems appreciates your hard work and dedication to our continued success! 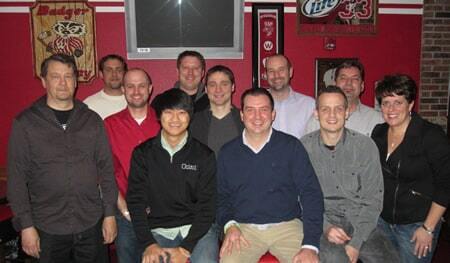 Ontech’s annual Holiday Party was held Dec 6th-8th at the Wilderness Resort in the Wisconsin Dells. Ontech invited all staff and their families to join in some fun and relaxation after a very busy year! Our staff commits a lot of time and effort to our clients and it’s important to make sure they have a great weekend with their families to relax and meet other families. At any time, we could be found in any of the 3 water parks, laser tag area, pottery shop, arcade, and of course, the local Ontech watering hole – TommyKnockers inside of Wilderness. Saturday night was a lot of fun as we gathered all the families together over at Monk’s for a nice dinner and Secret Santa gift Exchange. Ontech would like to wish all of our clients and followers a Happy Holidays as well! On Sunday September, 15th we had our first annual Ontech Systems Family Day at the Milwaukee County Zoo. The invitation was sent to mother nature a few months in advance, but she decided to send us a day full of gray skies and continuous rain! Well, that didn’t hold us back or the many children in the group who wanted nothing to do with the weather interrupting their day at the Zoo! The rain did not stop the animals or the kid favorite train rides either. It was a great day with lots of laughs and it was good to get our families together as well! Despite the weather, we may it a fun and look forward to better weather next year!